The specimen was collected from Rio de Janeiro, Brazil, during Darwin’s famous voyage aboard H.M.S. Beagle from 1831–1836. 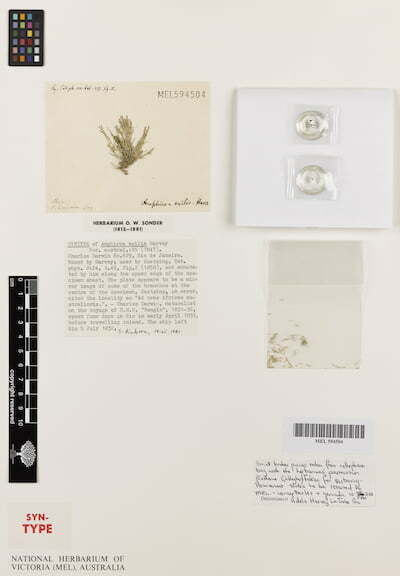 The ‘Type’ specimen of Amphiroa exilis, a species of red algae, was discovered as part of an ongoing curation of the Foreign Collection. A ‘Type’ specimen means that this is the first of its species to ever be formally collected and recorded. This finding puts the National Herbarium of Victoria in a small and prestigious league of overseas herbaria who hold collections made by Darwin on this voyage. “Discovering a specimen hand-collected by such a celebrated natural scientist is an honour and a privilege” says Professor Tim Entwisle, Director and Chief Executive at Royal Botanic Gardens Victoria.